A familiar site at University of Iowa football games won’t be getting a makeover anytime soon, despite the pleas from thousands of Hawkeye fans. A water tower that’s painted white, without any lettering or logos, stands on the UI Hospitals and Clinics campus just outside Kinnick Stadium. An online petition started by UI graduate Derek Yoder has gathered nearly 4,000 signatures. It calls for a change in the tower’s color scheme or design to "add to the game day atmosphere." UI spokesperson Tom Moore says university officials are aware of the petition and have talked about giving the tower a black and gold treatment. "It’s something that’s been discussed periodically," Moore said. "Thus far, there’s been no final decision on whether to proceed or not." The structure is repainted for maintenance every 10 to 15 years and was last painted in 2006. Moore says a new paint job for the tower probably isn’t a top priority, especially since the work in 2006 cost $370,000. "Particularly in this economic climate…paying for this project would be a very important issue," Moore said. 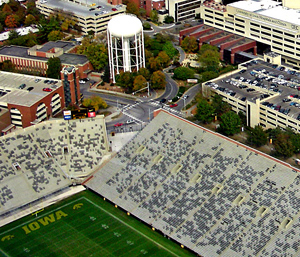 There are also plans in place to restructure the UI Hospitals and Clinics campus. "At some point in time, there may be a possibility that the water tower may be removed," Moore said. "So, while it may seem like a simple decision, actually there are a million things to consider." Many fans are suggesting a tigerhawk logo for the tower, which is controlled by UI Facilities Management. Moore says any decision would be up to officials in that department.